Patrick Gard was born and raised in Tucson, Arizona. He earned his Bachelor of Science Degree from the University of Arizona in 2000. 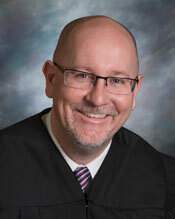 He then earned his Juris Doctorate from the James E. Rogers College of Law at the University of Arizona in 2003. After graduation, he was admitted to practice law in the State of Arizona and began working as a Deputy County Attorney at the Maricopa County Attorney’s Office. In 2007, he joined the Pinal County Attorney’s Office where he worked as a Deputy County Attorney in both the Juvenile Bureau as well as the Special Victims Bureau. While at the Pinal County Attorney’s Office, he served as co-chair to the Pinal County Domestic Violence Fatality Review Team and as a part of the steering committee for the Pinal County Domestic Violence Coalition. He was appointed as Superior Court Commissioner by Presiding Judge Stephen McCarville in November 2016. Patrick has been married to his wife Lacey since 2004, and they have two wonderful children.